While I was visiting the Unites States last year some friends needed help moving their little convertible automobile from California to Texas. Since I am always looking for new ways to have more adventures, I jumped at the chance to “help”. My plan was to roughly follow the western portion of old Route 66 and soak in as much Americana as I could. I have driven from the west coast to Texas a few times but I had never spent any time in the Painted Desert or Petrified National Forest. I really wanted to see it and get some great photographs but sometimes capturing desert scenes in a compelling way can be difficult. July at noontime in Winslow, Arizona is hot and with the top down I was baking. I could have put the top up and used the air conditioning, but that would have felt like cheating and I wanted to feel the wind – even if it felt like it was blasting from a hair dryer – and soak in the vast expanses with as little separation as possible. Cumulus clouds were beginning to build and I could see thunderstorms and cracks of lightning in the far distance. I even thought I could smell the rain and feel an occasional gust of cooler air, but your mind plays tricks on you I the desert. It didn’t matter; I had my music turned up loud and plenty of water and snacks in the cool box. 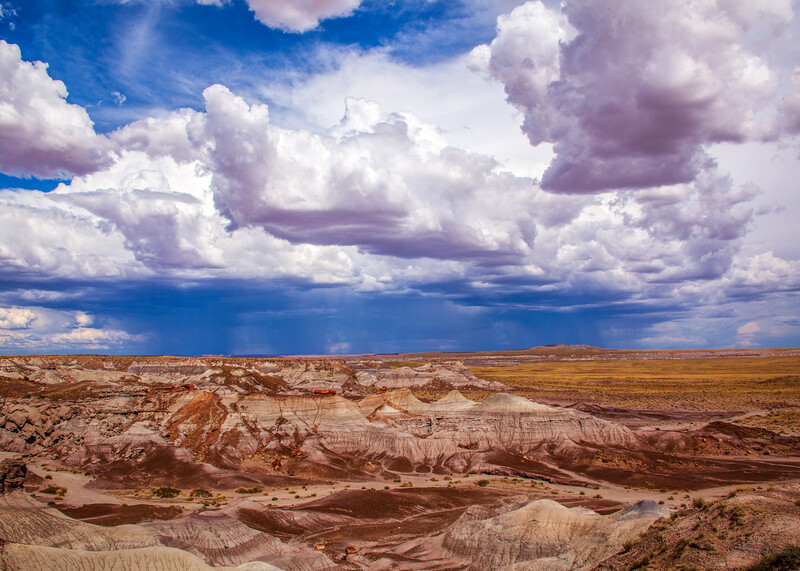 When I arrived at the entrance of Petrified Forest the sun, which typically seems to flatten any landscape at midday, was just beginning to cast a few shadows and there was actually some breeze from the growing storms. 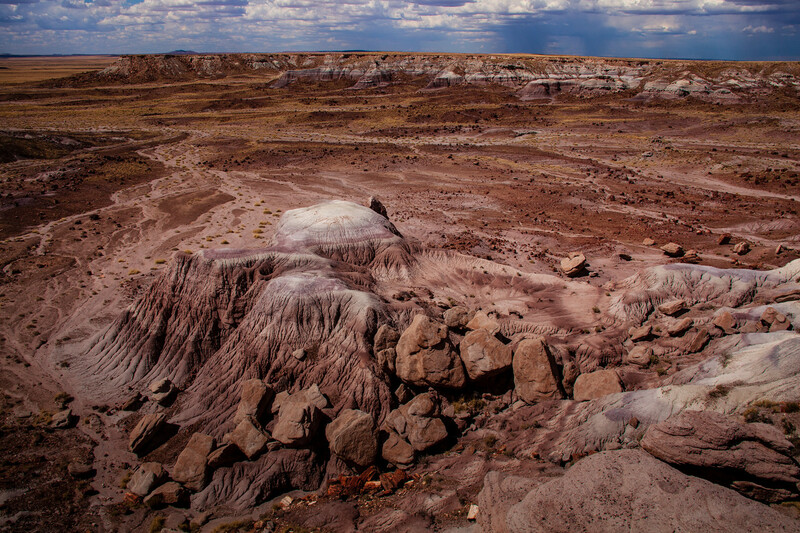 Photographing the Painted Desert is a bit like photographing mountain landscapes, but upside down. 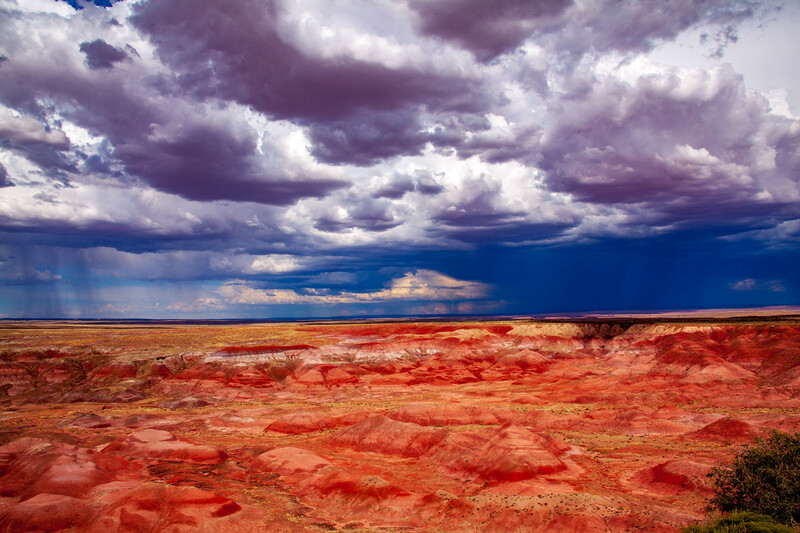 Most of the interesting topography in the Painted Desert is below the horizon. As I understand it – most of the colors in the multi-hued layers were formed by mud flowing in tropical rivers, dating back to the Triassic period. Also, during that time other layers were added when volcanic eruptions laid down layers of ash across the ancient landscape, blocking streams and adding more color. As layer upon layer was formed it eventually got compressed into clay and sandstone. 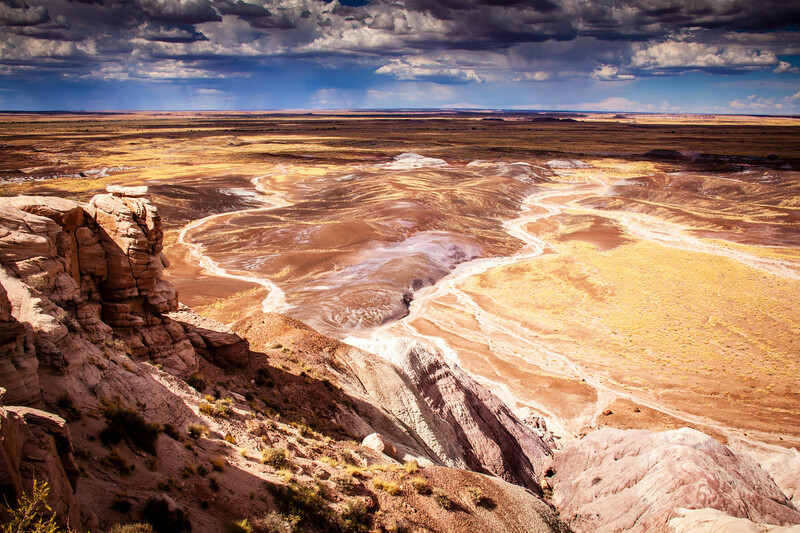 Later, tectonic forces raised the area (known as the Colorado Plateau) exposing it to rivers, streams and wind that over the millennia, eroded the softer material revealing the colorful stratum beneath. I loved the way the thunderstorms added interest to an otherwise spectacular landscape. As I moved from place to place I tried to picture the how the falling rain was teasing even more layers to the surface. The varying light caused by the storms was at once and blessing and a curse and caused the settings on the camera to go wild. Eventually, the storms got close enough that I thought it wise to retire back to the car. Whatever the geology, I wish I could have stayed forever but I wanted to get back on the road and to make it to my friend’s house on the other side of Albuquerque before it got too late. Part of the beauty of an unplanned road-trip; you never know exactly what you are going to get served up but invariably, with the right attitude, it can be a beautiful adventure. I made these images, handheld, with a Canon 5D Mark II Fullframe DSLR and a Canon EF 28-135mm f3.5-5.6 IS USM lens. It’s incredibly beautiful! And you’re right, the storm clouds definitely add great character to the photos!